Four shell buttons found by Guy DiGiugno while surface collecting along Raccoon Creek and Oldmans Creek in New Jersey. Picture illustrates front and back of the buttons. Two of the buttons have metal backs. The buttons were found in the 1980s and 1990s. The artifact is an agate swirled thumb pot manufactured by the Akro Agate Company in Clarksburg, West Virginia between 1930 and 1951. These thump pot fragments were recovered in Freehold, NJ. The base of this Depression glass horticulture vessel is embossed with "U.S.A."
This is a wine bottle seal from Somerset, New Jersey. Would love to know the manufacturer. If you have any information, please forward comments to the ASNJ webmaster at thilliard@rgaincorporated.com with subject heading "ASNJ." "Scott, The crowns on your seal certainly suggest a European connection. The seal appears to be made of four quadrants. I found only one early seal that consisted of a similar organization. From what I can gather, your seal is probably a coat of arms. I am going to guess that it might not be as old as you suggest. I checked in Antique Wine Bottles by Roger Dumbrell. He lists hundreds of seals, although none like yours. In fact, all of the seals of the 17th and 18th centuries were much rounder and not one of them was a squared shaped like yours. I cannot tell from the picture what the remaining glass attached to the seal is like. I am looking for some hint of where on the bottle the seal might have been attached (neck, shoulder or body). Its location might provide a clue to the age. Going out on a limb, I am going to suggest your seal might be late 19th century rather than 18th. Numerous wines and olive oils were made with applied seals in the 1880s. Maybe a reader will help out. Digger" (Bottle Books 2007). 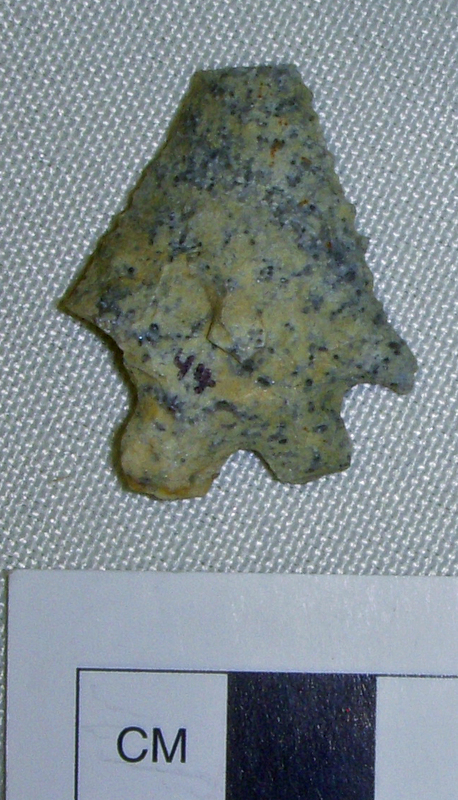 This bifurcate point was found by Larry Ledrick in Gloucester County, NJ. Mr. Ledrick displayed this point along with all the other artifacts he has found at this site during the 19th annual artifact show hosted by the Gloucester County Chapter of the ASNJ on May 5, 2016 at the West Deptford Public Library. Mr. Ledrick has been collecting this one site for 25 years. The bifurcate point appears to be made from orthoquartzite. Orthoquartzite is a type of material used by Native Americans in the Chesapeake Bay region and is not commonly found in artifact collections from New Jersey. This ceramic disc was found at the Hoffman Site (28GL228) in 1997. Ceramic discs were made by Native Americans. It appears to have a fabric impressed surface treatment and may date to the Woodland period. Archaeological excavations were conducted at the site over a 13-year period by Guy Digiugno and the Gloucester County Chapter of the ASNJ. The multi-component site contains dense archaeological deposits dating primarily from the Late Archaic to Late Woodland periods. A summary article about the site has recently been submitted for publication in the Bulletin of the Archaeological Society of New Jersey. This month's artifact is rather unusual. These masonry bricks were found in Gibbsboro, New Jersey. These bricks are made of flint. If you have found something similar at another site or if you have any additional information about this type of artifact, please forward your comments to ASNJ's webmaster at asnjwebmaster@gmail.com, subject heading "ASNJ." West Morris Mendham History Club Archaeological Dig with Sean McHugh, Wendy Miervaldis and Steve Santucci. The site is noted to have been constructed sometimes in the early 1750s as a tavern in Chester! The scene here is Sean taking the lead in directing students in digging the test pit for the builders trench. We look forward to heading back to the site in Spring. 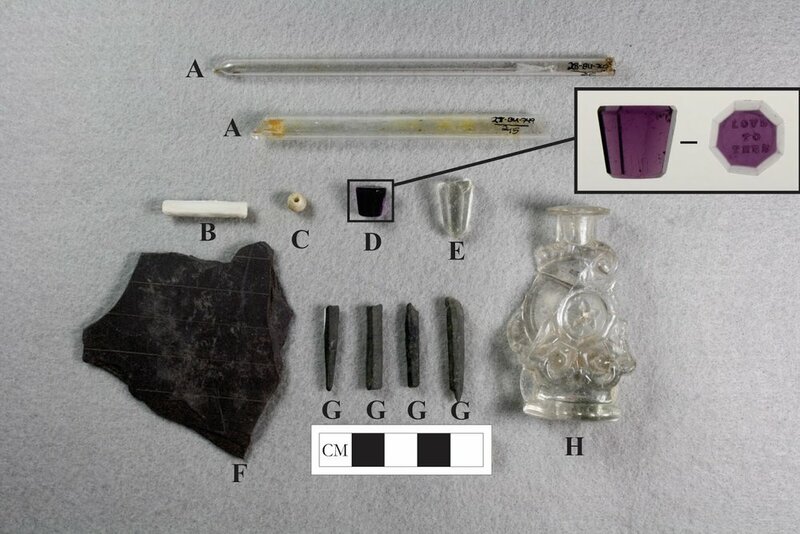 (Above left, left to right) Artifacts include yellowware, bottle glass and redware with manganese glaze. Do you have an artifact photo? Please send it to ASNJ's Webmaster, at asnjwebmaster@gmail.com, subject heading "ASNJ" with a brief description of the photo and name of the photographer. Decorative copper alloy plate to a Revolutionary War-era ammunition cartridge box associated with the Fusilier Regiment Erbprinz showing the crowned lion of Hess. 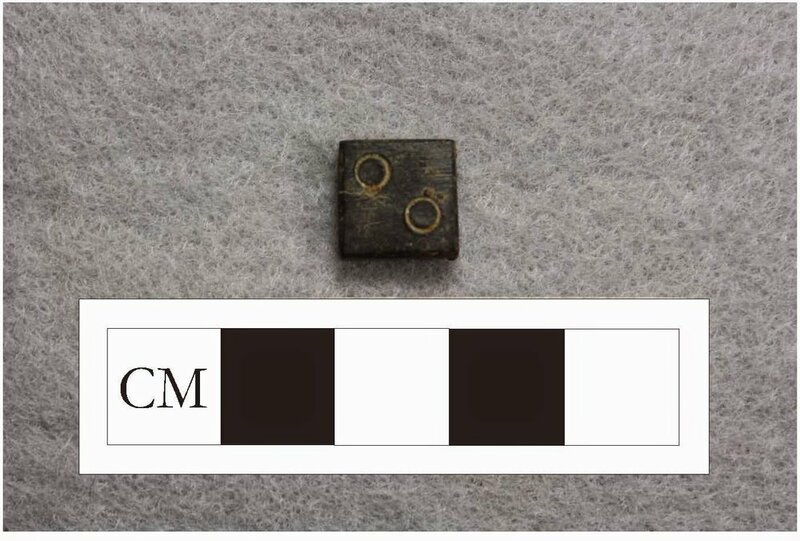 This artifact was likely part of a decorative plate on a Hessian artillery cartridge box from the Fusilier Regiment Erbprinz and was found in a well at an 18th-century farmstead in Manalapan, New Jersey near Monmouth Battlefield. While no skirmishes were reported on the site, the Battle of Monmouth was fought in 1778 roughly one mile northeast of the site and it may have been collected by one of the site occupants as a battle souvenir. Fragment of an 18th-century wine bottle seal from EU 2N. Photographer: Richard Veit; Date: April 9, 2012. 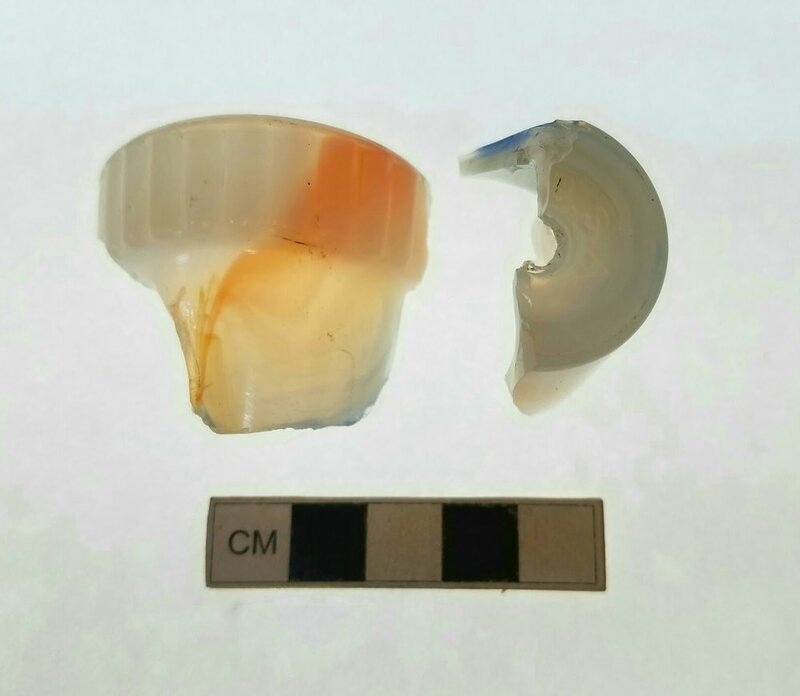 This fragment of an 18th-century wine bottle seal was recovered from EU 2N during Monmouth University’s 2011 Field School at White Hill Mansion in Fieldsboro, NJ. The seal is marked with the partial date, either 54 or 64, presumably 1754 or 1764, which coincided with Robert Field, Sr.’s ownership and occupation of the site. Seals of this nature are normally associated with individuals of wealth(White and Beaudry 2009:216) and were symbols of identity, particularly male identity (Veit and Huey 2014). 2014 “New Bottles Made with My Crest”: Colonial Bottle Seals from Eastern North America, a Gazetteer and Interpretation. Northeast Historical Archaeology 43:54-91. 2009 Artifacts and Personal Identity. In International Handbook of Historical Archaeology, ed. by Teresita Majewski and David Gaimster, pp. 209-219, Springer, New York. Photo Credit: Jo Grabas Sr. 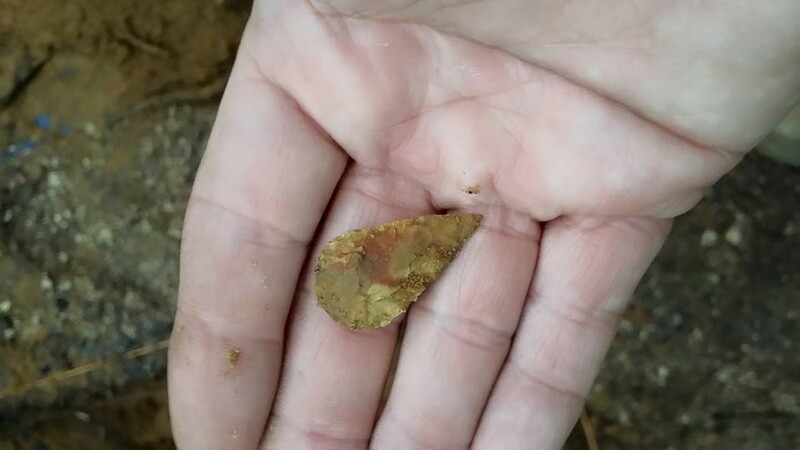 This month's artifact is a jasper tear drop projectile point, recovered from Turkey Swamp State Park during Monmouth University's 2015 field school season. This is a prehistoric artifact. The point was one of several exciting finds discovered this season. The park plans to eventually erect a display that will show several artifacts recovered from the park. Field school instructors and staff will analyze the data collected during the season over the next year. In the nineteenth-century a German officer was traveling through the area with two other officers. They approached a creek on the property and decided to wade through to the other side. One of the officers became separated from his horse during the crossing after his horse suddenly sank into a hole in the creek. The two eventually made their way back to shore, it was then that the officer noticed he had lost a spur during the ordeal. The boy who witnessed this event eventually grew into an old man and would later discover a spur during a construction project along the same creek. 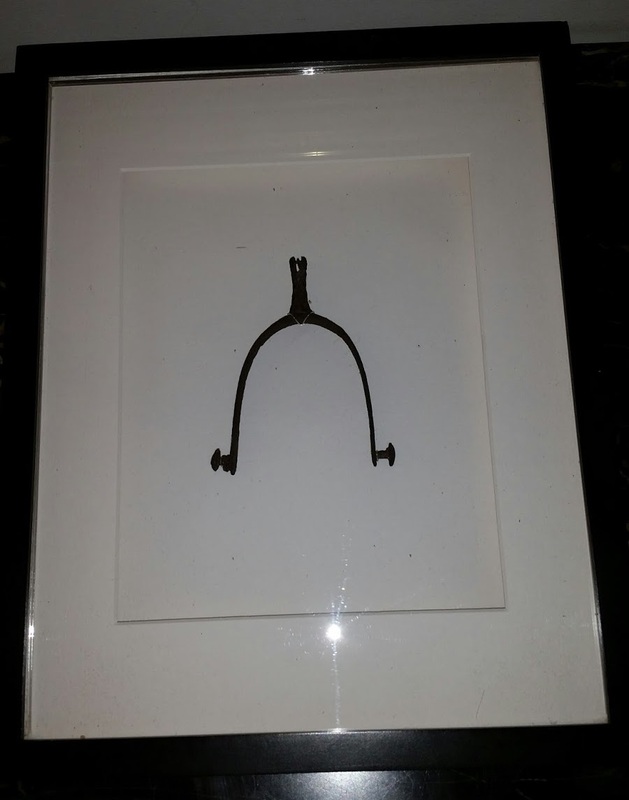 This spur is on display at the Walnford museum along with corresponding letters which describe these first-hand accounts. 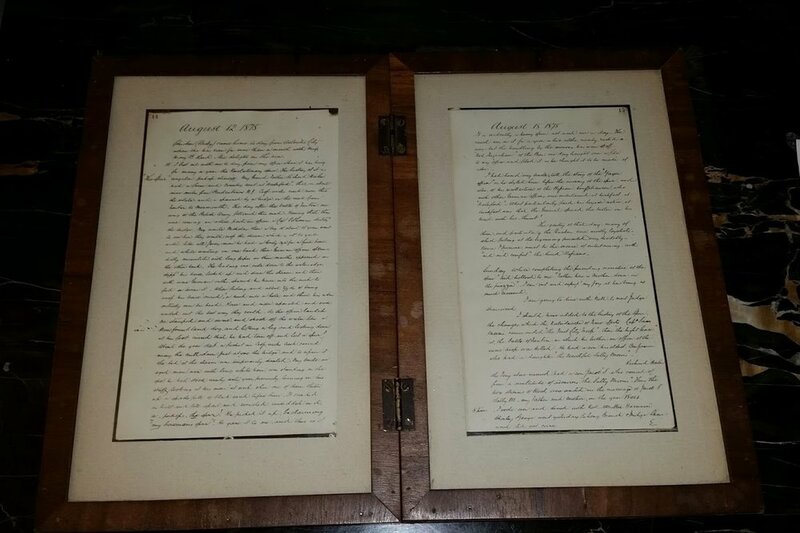 Special thanks to Dr. Rich Veit for this Artifact of the Month submission. Do you have an artifact or object you'd like to submit to ASNJ’s "Artifact of the Month" website posting? If so, please send a photograph, a brief description and a photo credit to asnjwebmaster@gmail.com, subject heading: “ASNJ Artifact”. This curious object is a scale weight. This weight could have been used by merchants to weigh money. Apothecaries once used similar weights to weigh medicinal herbs or other ingredients. This artifact dates to the 18th century and is associated with the Verree family of Burlington City, NJ. Special thanks to Michael and Allison Gall for this Artifact of the Month submission. Do you have an artifact or object you'd like to submit to ASNJ's "Artifact of the Month" website posting? If so, please send a photograph, brief description and a photo credit to asnjwebmaster@gmail.com, subject heading- “ASNJ Artifact”.